I get severe eye strain with strobing and I dont like the fact it adds input lag aswell, at least on the units I tried so far. On that note, OLED rolling scan is more similar to CRT than global-flash like a strobe backlight. This might be easier on your eyes (in addition to being more lagless than global-strobe backlights). Chief Blur Buster wrote: On that note, OLED rolling scan is more similar to CRT than global-flash like a strobe backlight. This might be easier on your eyes (in addition to being more lagless than global-strobe backlights). Yes! And considering my personal points I recently wrote about 240hz, this oled 144hz is something I will keep my eye on for sure. Fingers crossed for an european release and a fair price. Altho I k ow it will be expensive, but we are enthusiasts after all! No idea if that is a fair price but considering an Oled TV 55'' costs 1500€, i expect 22'' will be cheaper than 1000€, less size less manufacturing costs. People are used now to 27'' so i don't know how they would go back to 22'' paying more than 1000€. I'm fine with 24'' and 22''. I am defo fine with 22 inches aswell! In fact is my favourite size for competitive gaming as my eyes do 0 effort to spot everything at the edges (similar to curved panels effect). Anything bigger than 24 inches to me is a no go. I had ultrawides, had 27 inches , 25 inches. They are all too big for me and affect my gameplay and eye strain (I am very sensitive to eye strain, I can´t even use strobing for 10 minutes). Why you want strobing at 60hz VS no strobing 144hz? Notty_PT wrote: Why you want strobing at 60hz VS no strobing 144hz? 50 Hz is for PAL TV/youtube and 50 fips*/fps video files. 60 Hz is for most games (SEGA, Konami...), emulators, youtube and 60 fips*/fps video files. * - frames interlaced per second. I don't care 70 Hz or faster because the cons are CPU (and single top-end GPU) bottenecked, most games of 60 fps capped, more PC power/heat and the lifespan of CRT degraded. 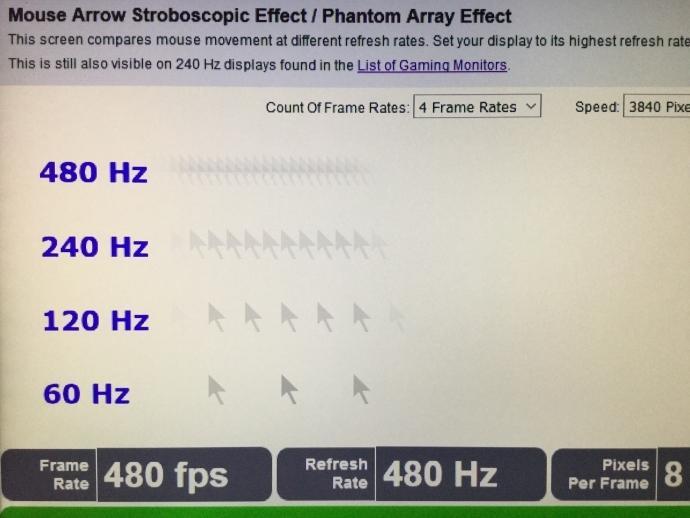 Even Low-Hz strobing has less motion blur than even 240Hz. "1ms of pixel visibility time (persistence) equals 1 pixel of motion blur per 1000 pixels/second"
As a result, strobed VSYNC ON is a much easier way to reach those "diminishing points of returns" than ultra refresh rates. It does have more stroboscopic effects, but motion clarity of TestUFO is exactly the same. Remember, persistence is pixel visibility time, you can use shorter frames or do strobing to reduce pixel visibility time. The motion blur math is the same. Strobe crosstalk (see FAQ) gets worse at higher Hz, so lowering the refresh rate well below maximum can massively improve strobe quality. A compromise strobe frequency is approximately 85Hz or 100Hz. Not as flickery as 60Hz, but not as strobe-crosstalky at 240Hz. That's why we sometimes like 1ms-flashed 60Hz strobed displays. Though 60Hz flickers quite a bit. Some of us have more eye pain from motion blur than eye pain from flicker. Vision sensitivity to various things vary a lot between humans. Some are sensitive to flicker (PWM, CRT, strobe, or only some kinds of flicker, etc). Others are not. Some can see perfectly clear better than 20/20. Others are not. Everybody tends to see slightly differently than the next human. So if flicker is unimportant, 60Hz blur reduction (e.g. BenQ XL2411P) is sometimes a godsend for those 60fps-locked games or gaming consoles. Sure, some of these are first world problems, but in the age of PWM-free monitors with GSYNC/ULMB, few monitors are properly targeted to the blur-sensitive. And the mantra of "use VSYNC OFF" does degrade strobe quality somewhat (kills the TestUFO-smooth effect) since framerate-locked motion has less eye-pain when you use strobed modes. Some people can't stand that, it creates major eye pain (moreso from this artifact THAN from the flicker!) Sometimes flicker is the problem. But we have readers here who get eye-pain from PWM but no pain from ULMB VSYNC ON. So, to fix the problem, you need to lower strobe rate to the same ballpark of the framerate....or preferably perfect match. Not everybody is bothered by it. But some of us are; the eyestrain disappears for some of us with perfect framerate-matched ULMB. Varying combinations of above sensitivities. e.g. eye pain from PWM-dimming and eye pain from ULMB until ULMB reaches 144Hz. e.g. eye pain from stutters AND blur AND flicker. Requiring ultra-Hz to fix. Thousands of people. Being the only website in the world, people reach out to me asking questions privately, email, PM, DM, etc. While I tell them to post publicly, sometimes they are desparate and I try to give them the best advice I can sometimes. Blur Busters has many dozens of cases of EACH category above. Some of it is poorly scientifically studied, but some of the scientific links are also in the lighting industry paper linked from the 1000Hz-Journey article. 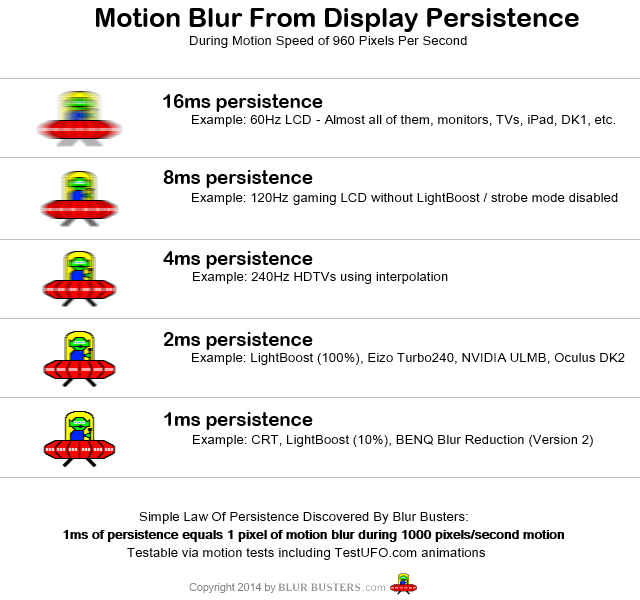 If any researcher reading this, I'm willing to fund a peer reviewed study about "motion blur eyestrain" and the varying thresholds of "flicker discomfort" ratio to "motion blur discomfort" that I've experienced hundreds of people with, ever since Blur Busters launched in Year 2012. No feeding words in other people's mouths, everyone has preferences. We all have our own preferences! So, back to low-Hz strobing. 1. Sit slightly further away. Modern computer monitors are bigger than CRT screens. 2. Reduce screen brightness or play games with dark backgrounds. LCDs are brighter than CRT. Then it's the lesser poison of "pick-poison" vision problems sometimes. Sure, some of us have to bump to 85Hz ULMB instead of the 60Hz ULMB Hack. Or we're perfectly fine with 60Hz strobing. It's annoying when NVIDIA disallows 60Hz ULMB when some manufacturers enable it. Some manufacturers just simply display a warning message "WARNING: Flicker. Discontinue using if you have headaches [...] yadda yadda" and that's good enough. Some of us need 60Hz strobing. So, now, there's side effects of low-Hz strobing. While motion blur is fixed, the stroboscopic effects aren't fixed. The lower the Hz, the more gapped motion is (e.g. steppy or dotty motion in games with high contrast stuff), regardless of whether you do strobing or not. That's why strobing often does not look good if frame rate diverges from strobe rate. This is the side effect caused by framerate (not strobe crosstalk caused by pixel response limitations). 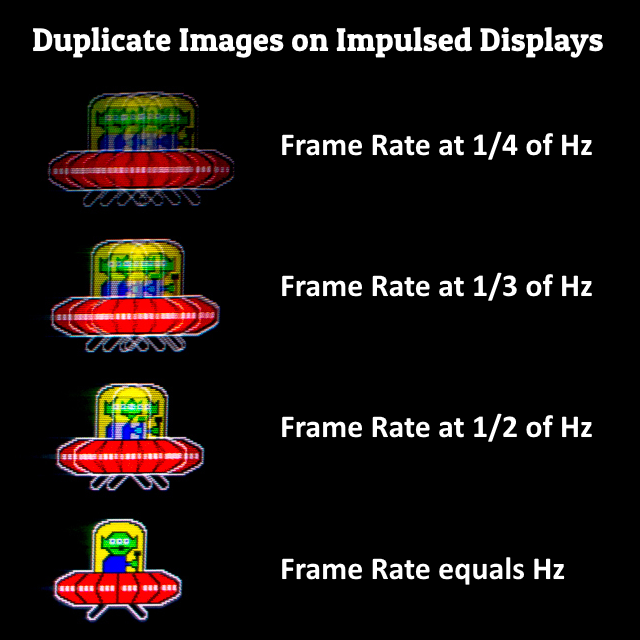 Same old fashioned CRT/plasma 30fps at 60Hz issue, the old double-image rule occurs when running framerate that is half strobe rate (e.g. 60fps at 120Hz ULMB). But, if stroboscopic artifacts are no problem, and you're not flicker sensitive....Then...Well, 60Hz strobing is a godsend. Certainly the strobe lag is a problem for competitive sports but some of us love to play scrolly RTS games that looks amazing with ULMB. With perfect-clear Nintendo-smooth Sega-arcade-smooth TestUFO-smooth ULMB in those scrolly games like RTS or Sonic Hedgehog platformers or if we're an "eye-tracker instead of a crosshairs-starer" in certain turny/scrolly/panny games that have no fixed points of references like a crosshairs. For the non-flicker-sensitive person, 60Hz ULMB hack (or ULMB+GSYNC hack with the RTSS 60fps cap) can be a godsend for emulator use, and look better than software-based black frame insertion. TL;DR Using low-Hz strobing can be a shortcut to motion nirvana than ultra-Hz, if you don't mind flicker or stroboscopic artifacts. You simply lower the strobe refresh rate to just above your flicker tolerance threshold. Then it's much easier to get "framerate = refreshrate = stroberate" with your GPU. Unfortunately, the only way to solve flicker+stroboscopic artifacts simultaneously with fixing motion blur, will be the ultra-Hz technique of motion blur elimination, instead of the strobe-based technique of motion blur reduction..
--> Even as games catch up, as well as Frame Rate Amplification Techonologies / Framepacing Technologies needing to catch up. --> New readers: Want to read more about the refresh rate race? Any ETA about this monitor? And does anyone know if it will be released on Europe aswell? I can´t wait to have this beauty. - 144hz + 0,1ms - no comments! I hope it doesn´t cost more than 500€, if it will be available on Europe. This is the only monitor that I will consider to replace my XG2402 as the king of gaming monitors! I can see a lot of pros going to buy this. The size and the fact it has almost no motion blur will make it the perfect competitive weapon!